I'd have to agree with the same exact things Anego said, but the beginning of the level is SO confusing as for where did the first ON/OFF switch is located. Because both magenta and blue "!" blocks are blocking off the area, I had to look in the level editor to locate the switch block. After beating this level, this is the only flaw I have pointed out. It was a nice level indeed. so... what can I say about this level? it's really good for the most part here! first off, I must say that the scenery here is superb, and it looks really dang good! the entire blue them ya did? 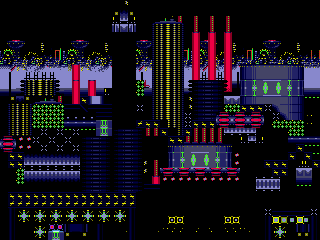 it really holds up here and well, really makes this level stand out to look well done and very pleasing on the eyes. as for the challenges? well, most are pretty good! the challenges this level has are usually quite simple and easy, like go through a place with so and so enemy. it isn't a crazy one, but a simple and fun one none the less! I'd say my favorite challenge though is waiting on the red shy guy to get past the munchers at 960x, as it was a fun little timing game right there! now then... for the only flaw this level has. the first one is the brick at 1800x, as due to how it's placed... it can cause you to die if you run to the left above it into the slope. it's... not a very good design choice if you ask me on that. so... all in all, besides that one little thing dragging this perfect level down... it was really good! but... I will say that it might help to make the on/off switch less hidden next time around as well!